ReutersCommander of US Africa Command, General William Ward (R), talks with Ugandan People’s Defence Force Colonel Sam Kavuma while touring the Gulu district in this April 10, 2008 handout photo courtesy of the U.S. Department of Defence. The Nigerian army, one of the biggest in Africa, should have little difficulty scattering the amateur jihadists. But its arsenal is decrepit and its troops poorly trained. Hence the government’s decision to spend $US1 billion on new aircraft and training, among other things. Critics question how much will go towards appropriate kit (never mind how much gets stolen by corrupt generals) and whether it is sensible to lavish resources on a force implicated in atrocities and human-rights abuses. Angola’s defence budget increased by more than one-third in 2013, to $US6 billion, overtaking South Africa as the biggest spender in sub-Saharan Africa. 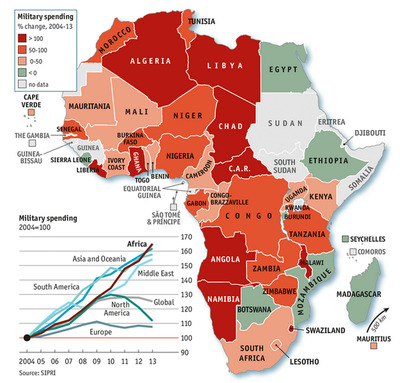 Other countries with rocketing defence budgets include Burkina Faso, Ghana, Namibia, Tanzania, Zambia and Zimbabwe. The continent’s biggest spender by far is Algeria, at $US10 billion. A big issue is whether troops have enough training to handle sophisticated new gear. Chad makes good use of its Sukhoi SU-25 jets–with the help of mercenaries. On the other hand, Congo-Brazzaville only manages to get its Mirage fighter jets into the air for national-day celebrations. South Africa bought 26 Gripen combat aircraft from Sweden but has mothballed half of them because of budget cuts. Uganda spent hundreds of millions of dollars on Sukhoi SU-30 combat aircraft but little on the precision weapons to go with them. These military improvements carry risks. Ambitious officers may misinterpret new might for political right–and may be tempted to seize power, as many have done before. Sophisticated arms may also fall into the wrong hands; witness the array of Libyan weapons that have fuelled conflicts across Africa, from Mali to the Central African Republic, since the fall of Muammar Qaddafi. 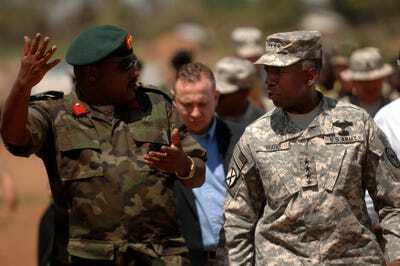 These structural changes to African armies may gradually alter the type of war that could be fought on the continent. Since the anti-colonial guerrilla wars of the past century, most African conflicts have been internal. Few countries previously had the ability, let alone the inclination, to fight their neighbours. In the late 1990s, several countries, including Angola and Zimbabwe, sent forces to take part in Congo’s civil war–to little avail. Ethiopia and Eritrea fought each other in 1998-2000. Tanzania sent its army into Uganda, along with guerrillas returning from exile, to overthrow Idi Amin in 1978. In general, however, few disputes between African countries have been liable to spark wars. But the build-up of beefier armies is bound to carry a risk.